JU computing science senior Michelle Burris presents her winning app at the HackaJax College Student Civic Hackathon in downtown Jacksonville. Turns out, there may be an app for that. 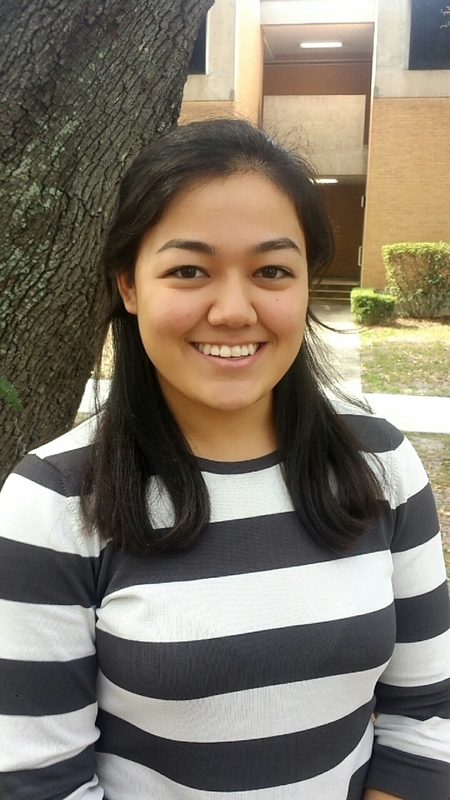 What’s App Jax won the recent HackaJax College Student Civic Hackathon in downtown Jacksonville after a team including 21-year-old computing science senior Michelle Burris impressed judges with its innovation and interactivity. The app builds digital and virtual ties first before uniting people in person from across the River City’s almost 900 square miles. Users can enter their various interests, and then through gameplay and other means are offered incentives to go to new businesses, events and volunteering opportunities throughout the city that might intrigue them. More points are earned for locations farther from users’ homes – places they might not likely have gone otherwise. HackaJax, sponsored by JU, was part of Innovation Week presented this month by JAXCOE (Jacksonville Community of Entrepreneurs). The week included a full slate of events for those in Northeast Florida’s “innovation” economy, from entrepreneurs, artists and small business owners to musicians, investors and educators. 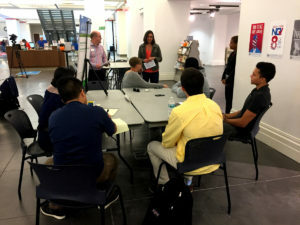 At HackaJax, two teams competed – one with four members, the other with three, and featuring a mixture of students from JU, the University of North Florida and Florida State College at Jacksonville. They were asked to solve a long-time dilemma in Jacksonville: bringing its split personalities together across a large land mass. 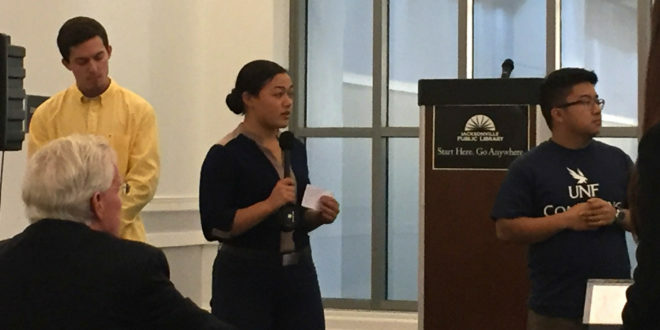 Burris worked with two students from UNF, and the trio brainstormed for six hours before creating a prototype of the app and presenting their solution in pitch style to the judges. Winning team members received a cash prize, presented their solution on the event’s main stage at the Innovation Connection Conference, and they now qualify as finalists in United Way of Northeast Florida’s Upstream Program to win a $10,000 grant to help kick-start their idea into reality. In 2015, Burris won the Davis College of Business’ “Dolphin Pitch,” which offered cash prizes to the top three winning startup ideas in a “Shark Tank”-style event. Her “Marine Online Mobile App” idea would allow Marines to access the Marine Corps’ main database using fingerprint recognition technology, giving them access to identification information, important leave paperwork, deployment and awards information. Burris, a JU Naval ROTC member who plans to join the Marines upon graduation, credited the University with helping create a positive environment of give-and-take and collaboration that helped her win the event.